Wendell Porter’s daughter, Erica, now 27, remembers a childhood where some infractions carried more weight than others. “I left a light on once,” Erica says. Porter, a University of Florida agricultural and biological engineering professor, has focused nearly four decades on energy issues. From researching solar panels at UF’s Energy Park to teaching AOM 2520 Global Sustainable Energy for UF undergrads to teaching a similar course for 45,000 students around the world online, his work has turned him into a carbon warrior. He says he is a cheerful warrior because he believes that everyone — all 323 million of us — can change our carbon consumption and change the nation’s as well. Porter pulls a book from his shelf from 1980, simply titled, “Energy.” Written in the years after the OPEC oil crisis of the early 1970s, it predicts a future of energy conservation for the U.S. Today, its predictions seem quaint. Porter says people underestimate the power of personal behavior. For example, he says, one railroad car of coal is 20 minutes of electricity. Something to think about, he says, the next time we leave our cellphone chargers plugged in all day when we tuck our cellphones into our pockets. When the AC failed, he bought the most efficient model on the market. Today, that model is so inefficient it could not be sold legally. Porter says he used to be the king of AC; his wife froze all the time. He reprogrammed his body by gradually changing the thermostat one degree at a time over several months. He plugs entertainment gear into a power strip and turns that off when not in use. “Unless you really insist on watching Gilligan’s Island a minute before it starts, that’s fine,” Porter says. 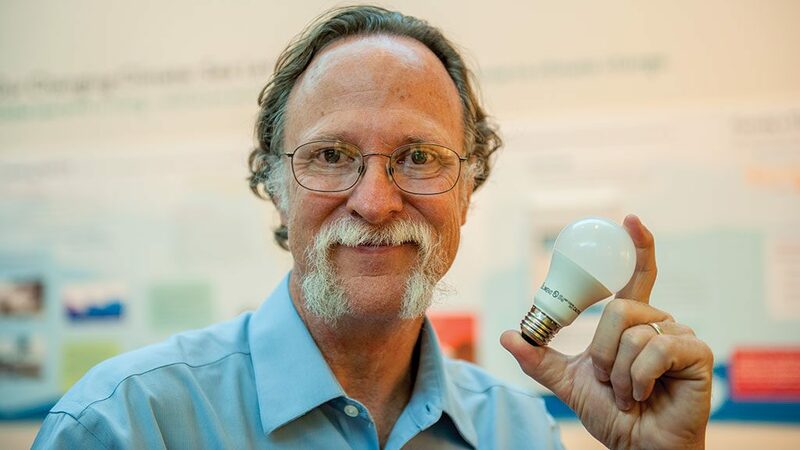 He changed the insulation in his attic — about 40 percent of U.S. homes have insulation below code — and switched to LED lights. Ultimately, he plans to install solar panels, buy a power wall with a battery bank for an electric car and unhook from the grid. And while you’re still driving a car with a combustion engine — not much longer, he predicts — you can lower your carbon consumption. Driving sensibly uses less fuel, and that makes it an almost radical act of social change. Porter demonstrates low-carbon-emission driving in a video he filmed for his class. “Most of our attitudes about energy in this country are sadly just a few years out of date, and a few years makes a world of difference,” Porter says. “When we say it’s too expensive to make a change, well, no, it’s not. The cheapest thing we can do is energy efficiency. You can cut utility use and transportation use in half just by becoming better stewards of your own money. Forget climate, just think about yourself. Americans, Porter says, are victims of modernization. Ironically, lack of modernization to date may make the developing world more nimble, more able to take advantage of new energy technologies, much like what happened with cellphones. Whole countries bypassed a telephone system based on landlines and went straight to cellphones. They can do that with energy, too. Porter is surprised that climate change, global warming and energy issues are still debated, especially since energy balance in the atmosphere is a matter of math. The first calculations of global warming were published in a paper in 1896 by the Swedish scientist Svante Arrhenius. It might be time, he says, to take it seriously. “When people say we can’t change that fast, I point to history. In 1940, before we entered World War II, this country built 900 military airplanes,” Porter says. “In 1943, we built 63,000.